Edinburgh: Knox Press, 1976. . 45 pages, poetry. Paper a bit browned. 85 stanza poem, in Gaelic, with an English translation.. Pamphlet. Good. London: Methuen & Co Ltd, 1937. . xiv + 208 pages, including 11 page glossary, colour frontispiece. Exterior and preliminaries grubby.. Second and Cheaper Edition. Cloth. Average Minus. Edinburgh: John Grant, 1905. . 303 pages. Dark green cloth with gilt decorated spine with a little wear and tear at top and bottom. page edges unevenly cut; some foxing, mainly to edges and endpapers. Carolina Oliphant, Baroness Nairne by marriage (1766-1845) was in her early life a populariser of Burns and an exponent of Jacobite poetry. She was the elder sister of the author Margaret Oliphant. After an evangelical conversion, there was, over time, a considerable change in the emphasis of her lifestyle. Her niece Caroline Oliphant (1807-1831) also wrote poetry; a short biography and a few pages of poems are included along with the much larger material on and by her aunt.. Cloth. Average. Olney: Oliver Ratcliff, Cowper Press, 1904. . 170 pages, fold-out Cowper genealogy. Spine discoloured, edges a bit foxed. Scarce.. Cloth. Average. London: Isbister & Co Ltd, 1900. . 247 pages, edges unevenly cut and foxed. Particularly referring to Marlowe, Shakespeare, Milton, Coleridge, Tennyson, and Browning.. Cloth. Average. London: James Nisbet & Co, 1883. . INCOMPLETE - 192 out of 212 pages, small book in blue cloth with gilt edges, front endpaper missing. Poems that Miss Havergal wrote during 1877 to 1879.. Cloth. Poor. Oxford: Oxford University Press, 1980. . xliii + 597 pages. Ex Buckinghamshire County Reference Library; library stamps to page edges and title pages; bookplate to inside front cover; dust jacket flap price-clipped; otherwise appears in little-used condition; the dust jacket is protected with a clear sleeve and external library markings are on the outside of this, so hopefully the jacket spine itself is unmarked. 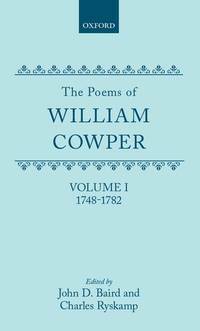 The first volume of a companion set to King and Ryskamp's 5-volume Letters and Prose Writings of William Cowper, also from Oxford.. Cloth. Average Plus/Average Plus. Oxford: Oxford University Press, 1992. . xlii + 598 + xxviii + 652 + xxxiv + 630 + xxxiv + 498 + xxvi + 246 pages. Corners of spines a bit rubbed, page edges slightly discoloured/grubby/stained, some light pencil annotation to first three volumes (incidentally by a biographer of Cowper); dust jackets encased in clear adhesive film.. Cloth. Good/Good. London: J Johnson and Co, 1812. . xxxvi + 383 + 410 + 443 + 430 pages. One inch pieces of leather missing from two spines. Authors include Flinders Petrie, Leonard King, James Smith Reid, David Samuel Margoliouth, Oscar Brilliant, Lewis Spence, F Appleby Holt.. Leather. Average Minus. London: Baldwin & Cradock, 1837. . xii + 387 pages, containing posthumously published poems, and a translation of Andreini's Adam. Front internal huinge broken.. Hard Cover. Average. Oxford: Clarendon Press, 1933. . 212 pages, a little pen marking.. Cloth. Average. Oxford: Lion Publishing, 1999. . 445 pages. 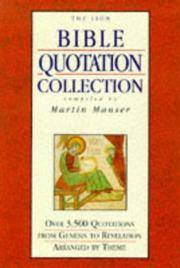 Over 3500 Bible quotations (from various versions) categorized by subject.. First Edition. Hard Cover. Good Plus/Good Plus. Olney: A. G. H. Osborn, 1976. . 96 pages.. Paperback. Very Good. London: Mr R D Cole, 1925. . 129 pages, in brown print, back cover dampstained (minimal smell). Three extended non-rhyming poems 1) The Voice of the People (on the trial of Jesus); 2) The Voice of God - Grace (on the second chapter of Acts); 3) The Voice of God - Judgement (imagining the experiences and thoughts of captives from the fall of Jerusalem). Cecil Belton belonged to the "Needed Truth" (Churches of God) Brethren movement. . Cloth. Average Minus. Amsterdam: A A Balkema, 1945. . 45 pages. Handwritten inscription to flyleaf: 'Published in "The House on the three canals" in Amsterdam by my predecessor Balkema; G Postma since 1947'. Gerke Postma (1920-2002) ran a famous bookshop in the Huis aan de Drie Grachten, Oudezijds Voorburgwal 249, Amsterdam, initially as a staff-member and then successor of August Aimé Balkema (1906-1996) as owner of the bookshop.. Paperback. Good. Chapel Hill: University of North Carolina Press, 1960. . x + 159 pages.. Cloth. Good/Average. London: Constable, 1949. . 201 pages, edges a little foxed.. First Edition. Cloth. Good. Oxford: Clarendon Press, 1945. . 131 pages, edges foxed, minor pen underliing and annotation. Text followed by notes explaining phrases in the text and their background.. Cloth. Average. Oxford: Clarendon Press, 1945. . 112 pages, edges foxed, minor pen underliing and annotation. Text followed by notes explaining phrases in the text and their background.. Cloth. Average. London: Pickering and Inglis, 1931. . vi + 359 pages. Undated. Author stated to be "One of the late Francis (sic) Ridley Havergal's Bible Class Boys" and (handwritten) "Called Home 22.3.50, Aged 84. 320 pages of poems, and three articles: Israel's Lost Identity (against British-Israelism); "The Church" in Revelation; and Daniel IX.. Cloth. Average.